Following the issue of a Request for Proposals (RFP) for the concession for the development, operation and management of an all-weather marina at Sa Maison, Transport Malta has selected the proposal submitted by Marina Di Valletta Consortium as being the most advantageous one. The consortium is made up local and Italian firms with the lead investor being the Italian marina operator Marina di Varazze srl. The planned 274 berth marina will be developed on the standards established by Azimut|Benetti Group (operated and owned by the same owner of Marina di Varazze srl) across their network of marinas. The marina shall be sheltered by the installation of a floating breakwater. 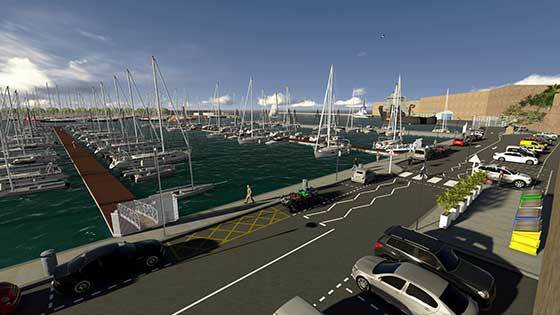 Infrastructural works envisage the construction of a wave-dissipating revetment along the Pieta quay, rendering this marina an all-year berthing facility. The marina is expected to be fully operational within three years. The contract will be signed in the coming days, with works to start when all formalities are in place. No works will be carried out during the current yachting season. Azimut|Benetti is the World's largest privately-owned group in the yachting sector and is the market leader in the construction of superyachts. Headquartered in Avigliana - Torino, the group operates five shipyards for the construction of Azimut Yachts and Benetti Yachts in Italy and one in Brazil. Azimut|Benetti operates Lusben Refit & Repair and a network of marinas in Livorno, Varazze, Viareggio, Savona and Moscow and is present in 138 offices across 68 countries.